Following the premium S-series smartphones such as the Galaxy S8 or S8+, S7 or S7 Edge, Note 8, Samsung has finally started rolling out Android 8.0 Oreo firmware update to the the A series phones. We have already seen official Nougat for the Galaxy A3, A5, and A7 devices and their many variants. Today, the Samsung Galaxy A3 2017 becomes the first A-series device to receive the Oreo firmware update. This new OTA update will take the Galaxy A3 2017 (with model number SM-A320F) to a new firmware build number (Baseband) A320FXXU3CRD4. So download and update your Galaxy A3 to Oreo update right now. As the OTA is based on Android 8.0.0, it features all the Oreo goodies such as better public Wi-Fi connections, new emoji, Picture-in-picture mode, improved multi-window, UI tweaks, a new camera app, revamped notifications, Notification Dots, Notification channels, Google Play Protect, Project Treble and much more. It also sport the latest April 2018 Android security patch. Unfortunately, the Android 8.0 OTA update will only be rolling out for the A-Series 2017 Editions. Not so much luck for the 2016 Editions. As the A3 received it, soon the Galaxy A5 2017, A7 2017, A3 SM-A320FL, and A3 SM-A320Y will receive Oreo update. Moreover, it is currently only rolling out in the Russian region and Serbia. But there are ways you can get the update too. In order to capture the OTA update, go to Settings, then go to About Device > System Updates, Tap on Check for system updates. If the update has arrived for your device then it will show and seek your permission to install it. How to update Samsung Galaxy A3 to Android 8.0 Oreo? The following Samsung firmware tool will help you download the latest full firmware Odin files for Samsung Galaxy A3 just like any other Samsung phone. With SamFirm tool, you can download the full stock Odin firmware files safely, faster, and comes directly from Samsung servers. It has no restrictions for downloading the firmware. It has no speed limit or bandwidth limit. As the Oreo update is available for Russian variant SM-A320F, any device with the same model number should be able to flash the following Odin firmware file. 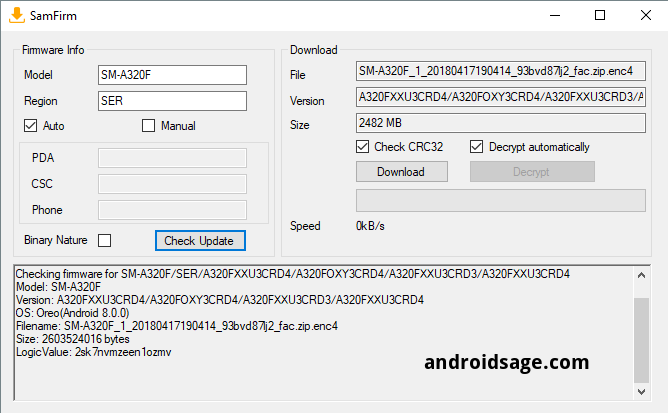 To download the latest full firmware Odin files for Android Oreo for Galaxy A3 SM-A320F variant, you need to use SamFirm tool. You may like to know the CSC code, Region code, or the Product code for your device. Make sure to fully charge your device battery. This procedure will factory reset your device. So take a full backup of your device data. Download the latest Samsung drivers on PC. How to install Android Oreo update for Galaxy A3 via Odin? Step-1 First off, download all the files to you PC from the download section. This includes the stock Oreo firmware, Odin tool, drivers, etc. Step-2 Enable OEM unlock (if available), USB Debugging and Advanced Reboot from developer options on your A3 device. Step-3 Extract all the files including the Oreo firmware zip, Odin tool and enter the extracted odin folder. Step-4 Install and run Odin on your PC as administrator. Step-5 Reboot Android into download mode using the Advanced reboot. Step-6 Connect your device via USB cable. Step-7 Look for the blue ID: COM and the added message in Odin. Step-8 Now click on the AP/PDA tab in Odin and add the stock Oreo firmware to it. It should be a .tar or .md5 extension file. If there are multiple slots, add them to their proper slots like BL, CSC, AP, etc. Step-9 Click on start option and begin the flashing. It takes a while to get the PASS message. Follow all the on screen instructions and your device will be updated to Android Oreo.